The line is quintessentially Daphne, and that’s why I love it. But, it betrays something that I also love. Whenever I think of champagne, it’s in celebration. It’s a heavenly libation, the ambrosia of the gods. And while Cole Porter might declaim that he gets no kick from champagne, I must confess: I do. Proseccos are all well and good, but I prefer my champagne a tad more brutish. Derived from 14th Century French, brut means raw and rough. Where champagne is concerned, it means dry and unsweetened. 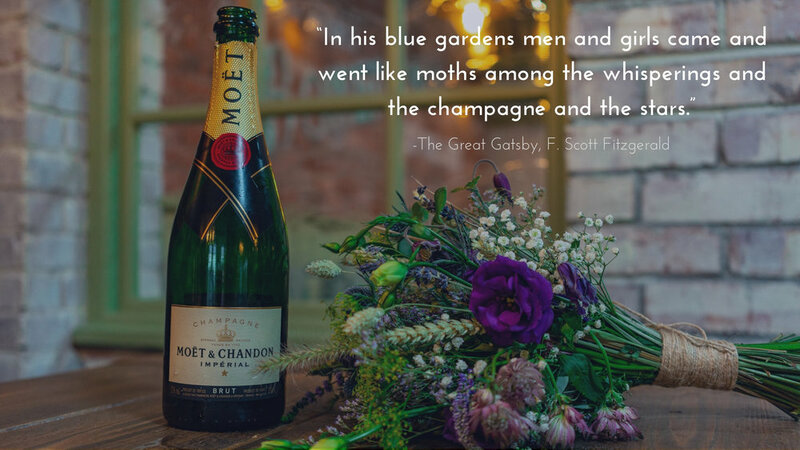 But, whether your champagne of choice is sweet, fruity, dry, or extra dry, I’m certain you’ll enjoy today’s post: a collection of lines about champagne that should tickle your nose and leave you wanting just a little bit more. While the Benedictine monk Dom Perignon did not invent champagne, he did perfect it in numerous ways- from fine tuning the method in which white wines are derived from black grapes to formulating the first corks and thickening the bottles so they didn’t explode from the wine’s carbonation. When Dom said these words, I like to think of him sitting in a wine cellar, perhaps a little bewitched and bewildered by the luminosity he’s just poured into his glass. Love should taste like champagne. As a matter of fact, champagne, like love, has been a great motivator of men. And while that might seem like an odd juxtaposition, let us not forget that every naval ship is christened with a sacrificial bottle to bless the bow and abate King Neptune on his watery throne. So, if you had to pour yourself a glass of champagne, what would it be? Are you an Asti Spumante sort of person? Or perhaps you prefer Brut, like me? Is Moët and Chandon the only way you’ll go, or does Verve Clicquot tickle your nose more? Or, are you into champagne cocktails? Let me know. I’d love to hear your champagne favorites. I’ll leave you with a little musical interlude from Lerner and Loewe’s adaptation of Collette’s Gigi: The Night They Invented Champagne!